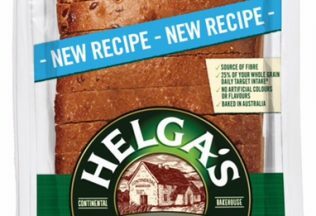 Helga’s is now selling a wholemeal gluten free bread loaf in Australian supermarkets. It says it is the first wholemeal gluten free loaf to be available in Australian supermarkets nationally. According to Helga’s, two slices of the bread account for 25 per cent of the recommended daily whole grain consumption target as set by the Australian Grains and Legumes Nutrition Council. To help launch the bread Helga’s has commissioned Sophie Henley, owner of Sydney-based gluten free café, Henley’s Wholefoods, to create a series of recipes using the bread. General Manager of the Grains and Legumes Nutrition Council, Michelle Broom, said that half of Australian adults are not meeting the 48g whole grain daily target. “This becomes even more challenging when you need to avoid wheat and other gluten containing whole grains,” she said. “So products like Helga’s Gluten Free Wholemeal are great news for people who avoid gluten,” Broom said. Helga’s, which is owned by Goodman Fielder, already sells a variety of gluten free breads in Australian supermarkets including Sunflower and Red Quinoa, Soy and Linseed and 5 Seeds. The new wholemeal option is available now from Coles and selected independent supermarkets with a recommended retail price of AUD $6.49. Pepsi Co Australia and New Zealand are launching new varieties of Red Rock Deli and Smith’s chips.